The Dolphin Chair is named for its aquatically-inspired seat back. Distinctly Scandinavian in design, the Dolphin Chair borrows shape and form from iconic 20th century designers like Finn Juhl and Hans Wegner. Its angled wood frame provides a classic balance of form, function, support and comfort. Its seat cushion enhances its mid-century appeal with its gray tweed-like upolstery. Just the mid century modern look I wanted. It';s light weight, sturdy and comfortable. The whole family approved. Love it! 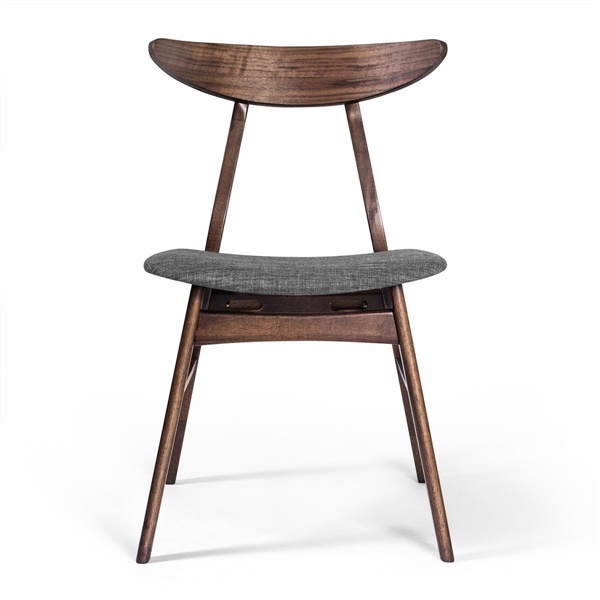 Their curved backs and slightly angled seat rests are notably comfortable, unlike any dining chair I've sat in before. I originally considered a few chairs from this site with straight angled frames. These have more character and create a more dynamic atmosphere in my dining room, plus I have to emphasize again the level of comfort which is relaxed without negatively impacting my posture. I am VERY HAPPY with my choice! Would have preferred more seat cushioning. I like the shape of the headrest on the back, wood finish and fabric color. I chose excellent style over high level of comfort but for dining purposes it works out decently. I have no complaints as far as attractiveness or service. Wonderful additions to the dining room, really spruced up the place - i love the way they look! open backrest creates more space - my dining room feels bigger! I had to think on it for a bit but my dining room somehow felt larger after these arrived, I think it may be the open backrest - it brings more airiness to the place, it feels like there's more space which I never even considered when i ordered these originally - if you want to create more room i highly suggest these! Beautiful slender dining chair with a wonderful combination of clean-cut and curved lines throughout the design - they offer an understated elegance which is difficult to find. I will definitely be ordering from Inmod again. Angled backrest looks and feels awesome! Very comfortable and attractive! Slightly rustic but with a contemporary twist, they really look lovely with my dining table. I'm happy with my selection! I absolutely LOVE these chairs. They were shipped quick, customer service was great and I love the slim backrest. It's attractive and equally supportive. Easy to put together too! What�€™s the weight rating on these chairs? The Dolphin Dining Chairs are rated for use of up to 250 lbs. The Dolphin Dining Chairs are not stackable. What country are these chairs made in? The Dolphin Dining Chairs are manufactured in China. What is the finish on these chairs? Coffee, cherry or walnut. Will the finish match any of the finishes available for the Vilhelm Extendable Dining Table ? The Dolphin Dining Chairs are finished in Walnut. While there is a walnut finish available for the Vilhelm Extendable Dining Table, we are unable to guarantee a perfect match, as the chairs and table are made by two different manufacturers.